Whether it is spring or autumn – discover Berlin by Boat & Bike. The rivers Spree and Havel, the Teltow Canal and numerous lakes offer the perfect setting for a round trip through Berlin and Potsdam on your floating hotel and an exciting way of getting to know the German capital from a different perspective. 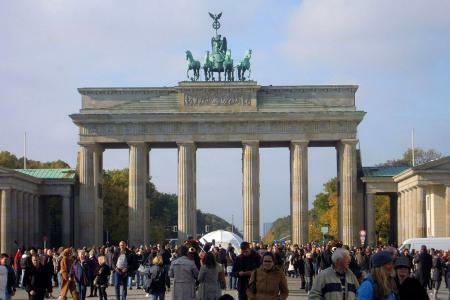 There are countless attractions on this journey, such as Potsdam’s historical city centre, Sanssauci Palace, Köpenick Palace and the beautiful town hall, Berlin’s museum island and the cathedral. This Boat & Bike tour in Berlin is easy to cycle. Here you can find details about your boat, the MS Gretha van Holland. Embarkation until 5 pm, then your boat will sail across the river Havel and numerous lakes to the former residence of Prussian kings and the German Kaiser. First you will have the opportunity to explore Potsdam, with its Dutch Quarter and the UNSECO world heritage site Sanssauci Palace. Then your boat will sail along the Teltow Canal to Köpenick. 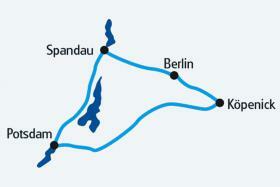 Via the river Spree you will reach Alt-Berlin (Old Berlin), there are various different routes you can take. Explore the city between the famous Friedrichstraße and Alexanderplatz. Your boat will take you back to Spandau, disembarkation until 9 am and departure. Here are the details on MS Gretha van Holland. We offer comfortable unisex-bikes with 7-speed gearboxes and coaster brakes, equipped with a bike bag and a bike lock. 15.04. + 19.04. + 26.04. 02.09. + 30.09. + 04.10. All prices per person in double cabin with bunk beds. 19.04. + 22.04. + 27.09. + 30.09. 26.04. + 29.04. + 20.05. + 02.09. + 23.09. 50 EUR surcharge cabin with ground-level beds on 15.04. + 04.10. Unattended car park near the quai, approx. EUR 20 for 4 days. Berlin-Spandau train station, approx. 500 m away from the quai. U7 to Rathaus Spandau, approx. 200 m away from the quai.